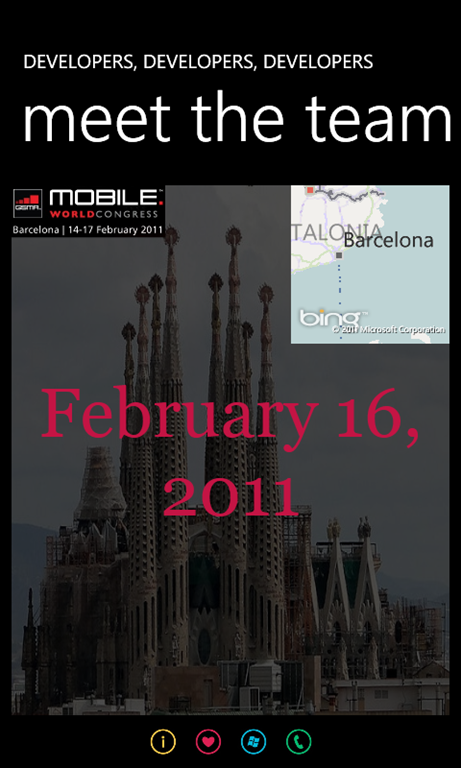 If you want to learn a lot about mobile computing and if you can be in Barcelona, Spain on February 16, 2011, here is a unique opportunity for you. During the Mobile World Congress, you have the possibility to attend Windows Phone Wednesday, a great guided tour around the Windows Phone 7 Platform, hosted by Microsoft for application developers. In one single day you will learn a lot about developing applications for Windows Phone 7. All aspects of application development for the phone are covered, including building apps and games, marketplace monetization, tips and tricks for certification and an open panel discussion where you can get answers to your burning questions. Make sure to sign up immediately, because seats are limited. To register, please send an email to creators@microsoft.com with the following details: First and last name, email address for the invite and company name. Your conference pass gets you into the ADC as well as into the Expo Hall at Mobile World Congress. The Windows Phone 7 team is looking forward to seeing you in Barcelona.